This is another one of our "reports" on a charcoal product, vs. the normal reviews that we perform for ordinary lump charcoals. While this product consists of lump charcoal, the fact that it is "Instant Light" and is intended to be burned all at once in a grill, not a smoker, makes it different enough that a full review isn't warranted. Nor would it be fair to compare this product against ordinary lump charcoals. What we have here is a lump charcoal that has been impregnated with a vegetable-based wax. You light the bag and burn the entire bag for one cooking session. The product is environmentally friendly. The bag is made from recycled paper, and after you have finished cooking, the ashes can be thrown in the garden. The first thing we noticed was that the Kingsford bag when opened absolutely reeks of petroleum based lighter fluid while the OCC bag had no smell at all. When lighting the Match Light, you can smell the lighter fluid burning until the last flames die out. When lighting the OCC bag, you can initially smell a mild smell of wax which dissipates when the flames die out. The Kingsford charcoal burns with a roaring flame while the OCC charcoal burns with a safer, smaller flame about half the size of the Kingsford flame. Both products seem to be overly optimistic on their claims for how soon you can be cooking. Kingsford says "ready in about 10 minutes." The OCC charcoal says "wait 15 to 20 minutes..." Our definition of "ready" was that all the flames had gone out. Well, Kingsford was "ready" in 28 minutes, while the OCC charcoal was "ready" in 27 minutes. One other thing about starting the OCC charcoal; you might want to stir it around a bit to make sure all the charcoal gets exposed to air. This allows all the wax to burn off. If you don't some of the pieces on the bottom of the grill won't get a chance to burn off the wax, and you will smell the wax burning later in the cook. So, once started, how hot do these charcoals burn? Our method was the "hold your hands over the fire until you scream" method. The units of measurement are seconds. Initially, we could hold our hands over the Kingsford for 3 seconds. The OCC charcoal was hotter at 2 seconds. How did the heat last? Well, the Kingsford charcoal produces gargantuan volumes of ash which then serves to insulate the fire and lower the heat. As a result, the Kingsford charcoal required constant attention (stirring to knock the ash of the briquettes) throughout the entire cook in order to maintain grilling temperatures. We noticed the first temperature drop after 23 minutes, and then had to stir things up about every 20 minutes. We were able to keep a useful temperature for about 1 hour and 40 minutes. The OCC charcoal didn't require stirring for 1 hour 17 minutes. Then we had to stir things up after 30 minutes, 15 minutes and finally 10 minutes. We were able to keep the temperature up at grilling temperatures for just over 2 hours. So, even though we burned 20% more Kingsford than OCC, OCC could cook 20% longer. They both cost the same per use. OCC has no odor. Kingsford stinks to high heaven. OCC burns hotter than Kingsford. OCC burns longer than Kingsford, with less need to tend the fire. OCC is pure charcoal with a vegetable wax lighter. Kingsford has a petroleum lighter and contains all the ingredients listed here. 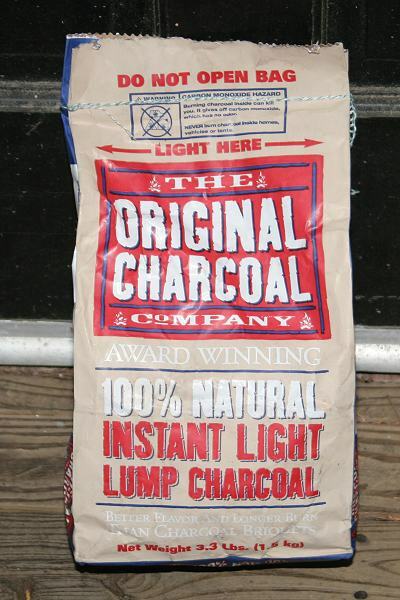 If you need a "single use" charcoal product, the Original Charcoal Company's Instant Light Lump Charcoal is a great option. It's lump, it burns hot and long, it's environmentally friendly and goes for a competitive price. 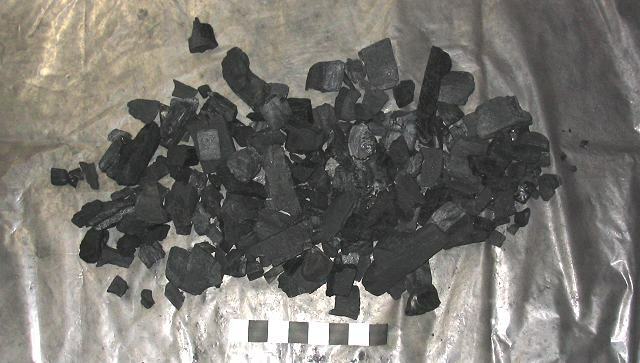 "Award Winning", "100% Natural Instant Light Lump Charcoal", "Better Flavor And Longer Burn Than Charcoal Briquets"
Originally used in cave drawings, by 3,500 BC all-natural hardwood charcoal fueled civilization across the globe. Today, all-natural hardwood lump charcoal is recognized as the preeminent fuel of choice for grilling throughout the world. Our charcoal is the charcoal of choice by many of the top-ranked BBQ teams in the country. Visit www.originalcharcoal.com to learn how you too can grill like a champion and say goodbye to chemical laden briquets." "Our Mission At Original Charcoal Company: To provide you an all-natural hardwood lump charcoal that produces outstanding flavor to your grilled food." Chemical Free - Our charcoal is made from 100% all-natural hardwoods and contains no construction scrap and no fillers. 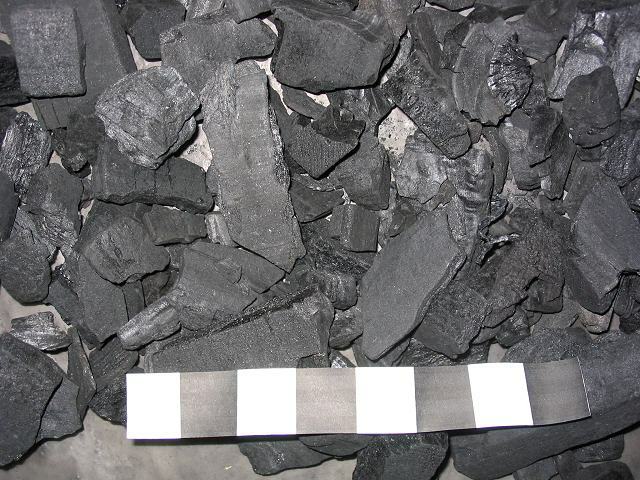 Briquets are said to carry 80-90% non-wood, chemical fillers, mixed with a petroleum-based binder, and are toxic to the environment. Clean Burning - Because our charcoal doesn't contain fillers such as lignite coal dust, lime, and sand, your grill will have no pasty residue build-up, and the small amount of ash and coals leftover from our charcoal, once cooled, are good for your garden. Best Flavor - Our all-natural hardwood charcoal produces a true campfire flavor. it is no surprise that food tastes so delicious cooked on our charcoal when you compare the ingredients with other brands. Fast Starting/Burns Hotter - Our lump charcoal lights as fast and burns hotter than briquets, giving you a greater temperature range to cook with. Longest Lasting - BBQ experts, restaurants, and backyard enthusiasts across the country all recognize our lump charcoal burns up to 3x longer than typical briquet charcoal." 3. Wait 15-20 minutes for charcoal to be ashed over and place food on the grill.